This weekend, we went to our grocery shop which specializes in selling South Indian stuff especially from my home state, Kerala. At the entrance he had kept some jackfruit that was cut open to sell. I fell in love with it instantly and asked hubby can we buy one. He agreed immediately. While searching for other items to buy, we spotted a couple, wife is from Kerala and hubby is from Tamil Nadu. Both were showing interest in buying the Jack fruit. The guy asked Paul the owner of the shop to cut a jack fruit that he wanted to purchase, Paul immediately took a Jack fruit and cut it and gave one fruit to taste, after tasting the wife left the aisle without saying anything, hubby did the taste test, and told the shop owner, the fruit is not crunchy? Then again asked Paul to cut another jackfruit, he did that too and gave him to taste test, again his comment was fruit is not crunchy? Third time, Paul showed him about ripe Jackfruit, and told him if you buy only I will cut the fruit. He told him, he can’t buy until he does the taste test. Finally their, buying and selling ends there. My hubby was joking, and asked me if I can tell them to fry the jackfruit it is going to crunchy. I told him, don’t tell, if you tell this to him. He may not like it. Then we went there and did a taste test, yes it was really a sweet fruit, I loved it and bought it. 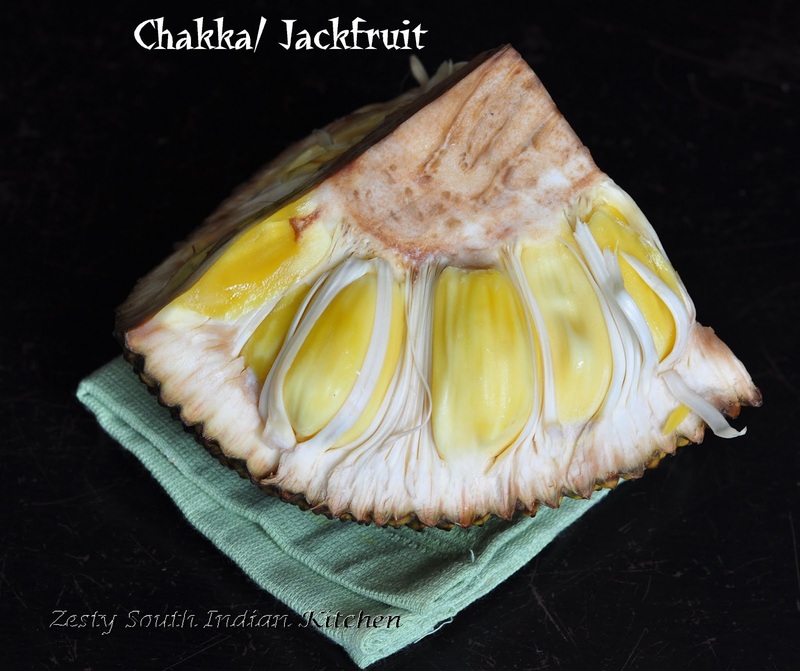 This Jackfruit is mixture of Koozha and Varikka. 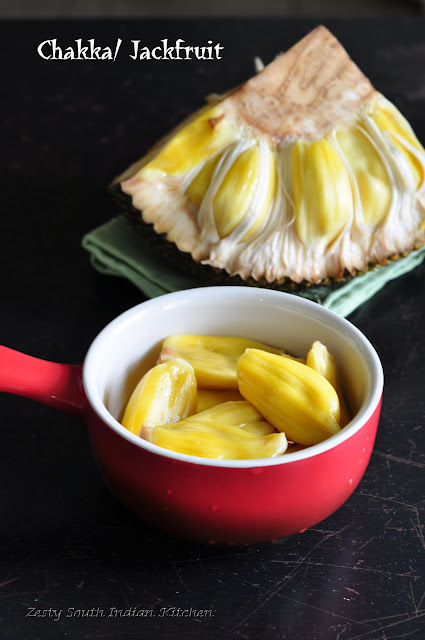 There are two varieties of Jackfruit available, one is Varikkahas slightly hard inner flesh when ripe, while the other inner flesh of the ripe koozha fruit is very soft and almost dissolving. We bought around 20 pound of Jackfruit, it is about half of one Jackfruit. It cost us $20. Yes it is expensive, but you want to eat it you have to pay for it? After coming home, I cleaned jackfruit ((for how to clean the jackfruit take a look here) and kept some for eating and with rest I thought I will make some chakka varatti/Jackfruit preserve. I got tempted by my friend Kaveri of the Palakad chamyal’s this post. My hubby asked me do you know how to make chakka varatti, I told him; I have seen it while grandma making it. But not tried by myself. He nodded his head to go ahead. Kaveri used about equal amount of sugar to jackfruit however I reduce the amount as I have seen my grandma makes with less amount of sugar. Making chakka varatti/ Jackfruit preserve is a tedious job, if you are lazy don’t ever try to do it. I have seen my grandma to start early in the morning and finish by the late night. 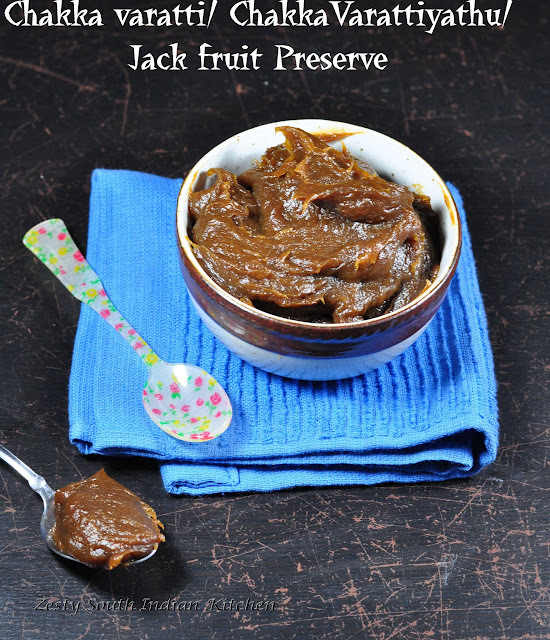 Start from peeling the skin of jackfruit cleaning and cutting into finely chopped pieces. That process is done by my grandma, aunt and a neighbor, and usually it a mega kitchen project. She would start plucking the fruit when crows start biting the ripe fruit on the Jack fruit tree. She will say” Chakka pazhuthaychu ennu thonarathu” Means jackfruit is getting ripe we need to pluck rest of them. 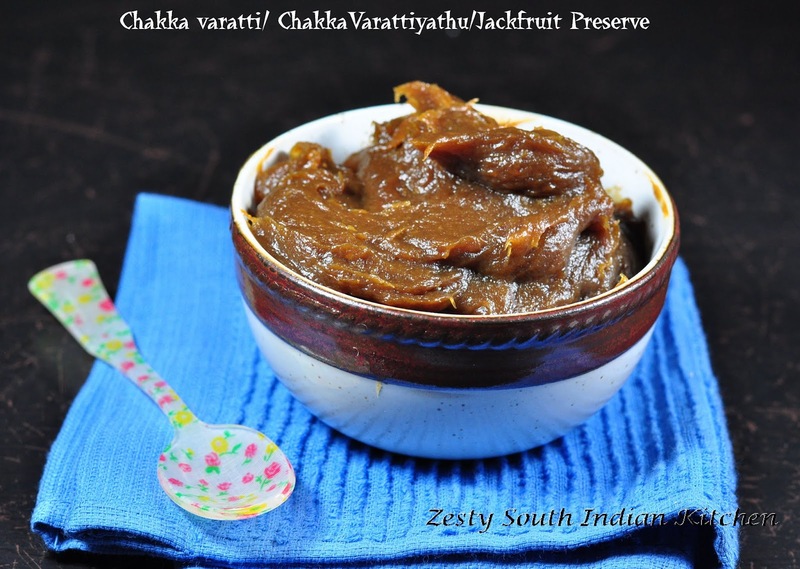 This chakka varatti is one way of persevering the abundant supply of fruit available during the season. The chopped pieces and cooked with water and finally smashed with spoon to make a uniform paste. Then this cooked jackfruit mixtures is again bring to boil with jaggery ( unrefined sugar). Then the fun part begins, to continuously stir and cooking the mixture until the entire water is evaporated and when it starts to thicken and stick to the bottom of pan, she will add ghee and cook until a thick paste is formed. If you continue the stirring and cooking the entire chakka varatti can be made it into a ball. Finally grandma would store it into a thick china pot with tight lid, and keeps it in storage. The other way of storing them is in wilted banana leaf, brush with little ghee and keep this ball shaped chakka varatti and cover them tightly and store it in an air tight container. These types of storing methods are done when there was no refrigerator available. Now I have refrigerator, I will freeze them. 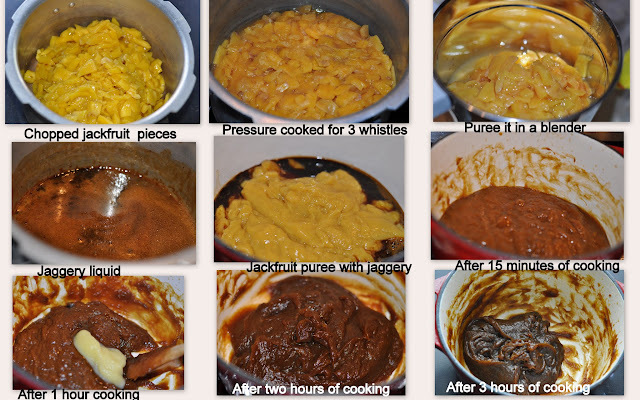 I also did a short cut way of cooking the jackfruit in pressure cook and pureeing them using a blender. I don’t have traditional vessel which grandma used to make chakka varatti, so I used my new favorite Dutch oven to make this. I took about 3.15 hours to make this delicious nostalgic treat. My princess did a taste test and told me yes it taste great. 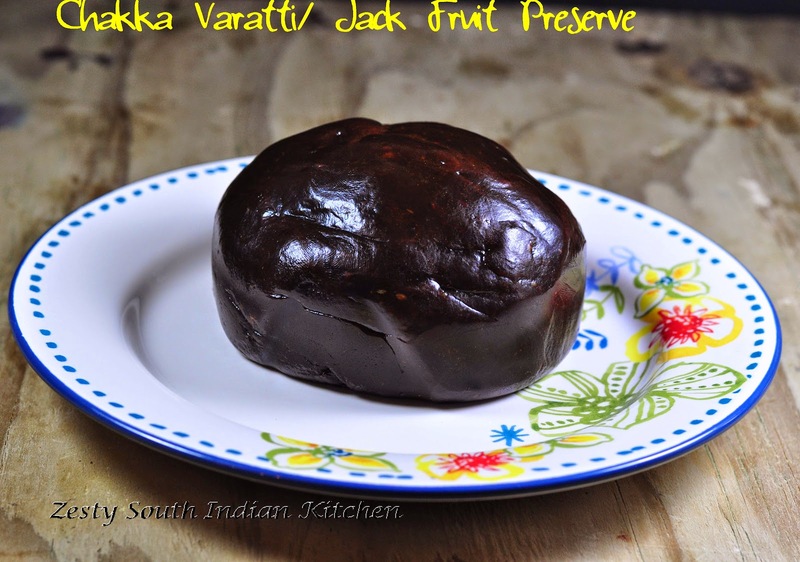 I am planning to make some traditional sweets like chakkaPayasam/ Jackfruit pudding, Chakka appam / Steamed jackfruit parcel etc with this delicious preserve, so keep tuned in. Here comes the recipe. 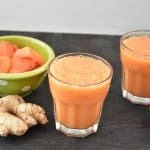 Pressure cook jackfruit pulps till soft by adding 1/2 cup of water for about 3 whistles and set aside for cooling.Then grind it to a smooth paste in a blender into a fine paste. 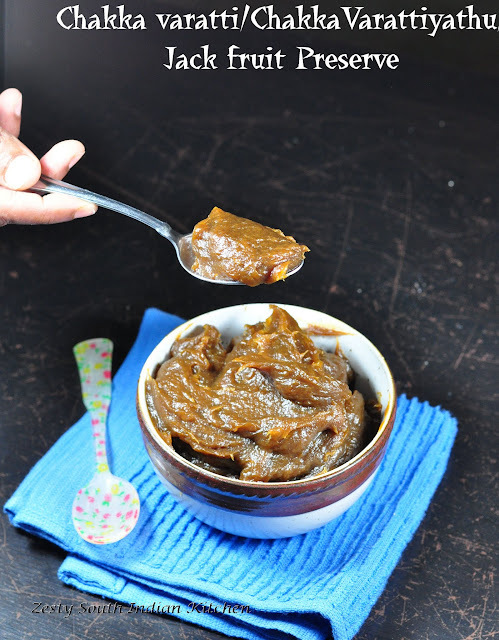 Take jaggery in another pan and melt it by adding 1/2 cup water. Strain and remove any impurities from the jaggery liquid. Heat the jackfruit pulp and jaggery in a thick bottom pan, I used dutch oven..Allow the mixture to cook on low flame till the water is reduced. Remember to stir continuously and not to increase the heat,to prevent it from sticking to the vessel.Add 1 tsp of ghee,whenever it starts to stick,probably in every 30 minutes. .Continue the process,until you get a dark brown colored,thick and tight preserve. It took about 3 .5 hours for me.Allow it to cool naturally and keep it in a dry airtight container. If you want to store it for long time, freeze it. When you are ready to use it thaw well and use it. 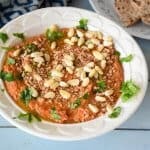 chakka varatti looks yum!! New to me. It looks more like halwa!! 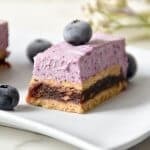 Love the texture, color and i’m sure it tasted heavenly!! Also loved reading the other couple’s jack fruit story, LOL!! 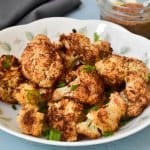 Looks yummy, new recipe to me !! NICE POST AND LOOKS DELICIOUS…. Beautifully made chakka varatii…Looks yumm..The cut jackfruit looks so fresh and good…Thanks for the mention dear. Looks so delicious and mouth watering, perfectly made. This is so new to me though we have jack fruit over here. I buy the already peeled ones because I know how the big and expensive it can be buying the whole fruit. Interesting and the sweet burst is tempting. Chakka varti awww so so delicious and inviting it looks. Looks delicious. A very new dish for me. I love the way you have served it. Swathi, sad to say but I’ve never tasted this exotic fruit before! 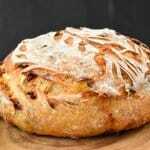 The way you describe it, sounds amazing, and it looks so tempting and delicious made into a jam! Lovely photos, as well! Adipoli,love this so much,lucky you..you are getting chakka there. Seems missed a lot of your post dear..this post makes me nostalgic. After cooking in pressure cooker you may microwave like you make any other halwa and at the last stage cover the halwa while microwaving so that it will not become rubbery. This way you save a lot of time.